The first few weeks of September would be my favorite time of the year if I didn’t know what comes directly after them. The weather is great and the locally produced food (including frozen custard!) is fantastic. Our haul from the CSA was exceptionally big this week so, paired with the harvest from our own backyard, I’ve had reason to make a lot of fresh fruits and veggies. First up is this beautiful bacon, lettuce, and peach sandwich, which I think was originally introduced to me last year by the writers behind the Eat at Burp! blog. I know it would take a lot to get a lot of folks to get beyond their BLT comfort zone, but a freshly sliced peach might be just what the doctor ordered. You create the sandwich in the same fashion, but it leaves you with a sweet and salty combo that’s just divine. For an added bonus, may I suggest a heaping spoonful of fresh pesto in place of your traditional mayo? Oh my. Peaches and pesto, who knew?! If pesto isn’t your thing, try poppy-seed dressing or even a touch of fancy mustard. If the peaches aren’t too juicy, you’ll need some sort of sauce to moisten the bread. You’ll notice my recipe doesn’t stop once the sandwich is done. 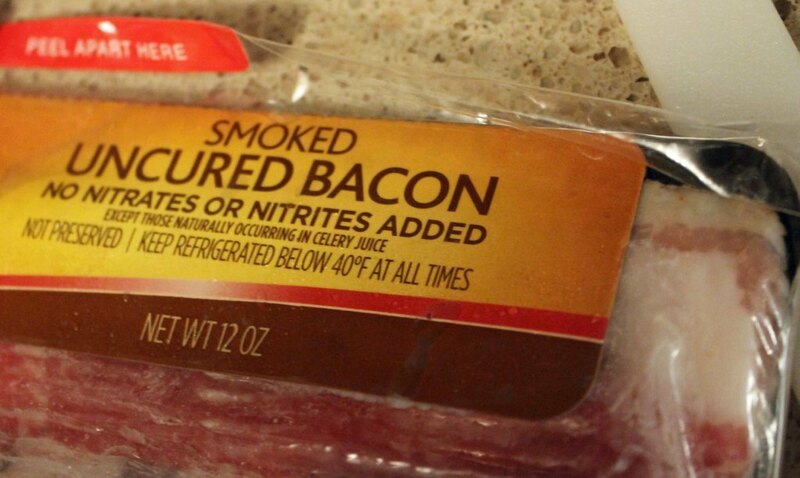 I also made green beans this same night using the drippings from the bacon. Don’t clean it up yet! Come back tomorrow for a dill butter green bean recipe that’ll get everyone eating their veggies! 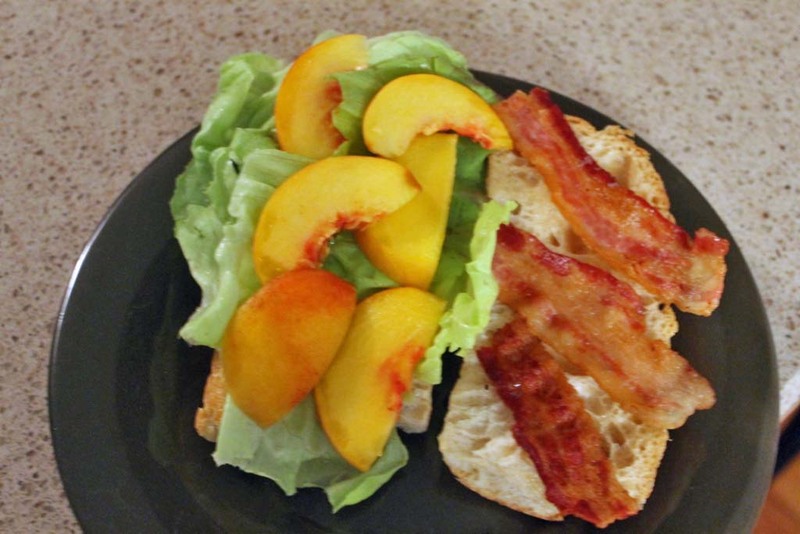 Bacon, lettuce, peaches, and pesto combine to make a perfect August sandwich. 2. 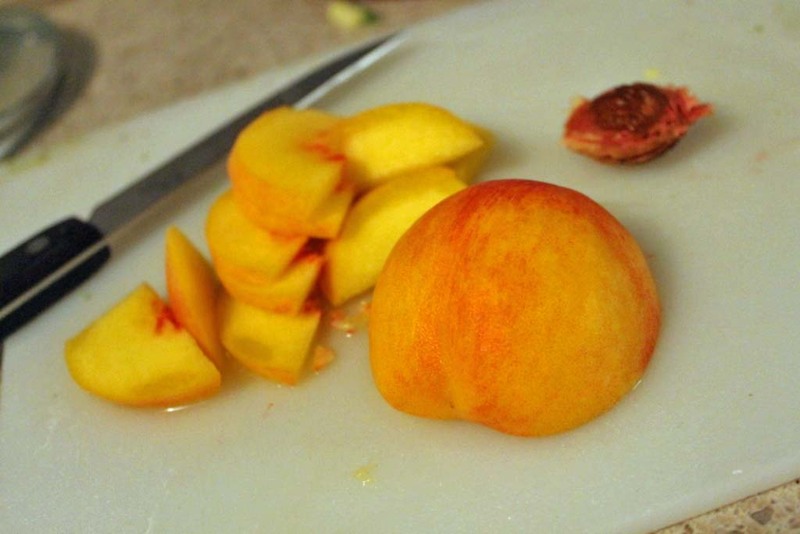 Slice peach into thin strips. Wash lettuce, cut into good size to add to sandwich. 3. Cut baguette into two 6" pieces, then cut horizontally. 4. Spread half of pesto over one side of each sandwich. Stack peach slices, lettuce leaves, and bacon slices. Add top piece of bread to form the sandwich, perhaps using toothpicks to keep together.